Wonsan orphanage opened in late 2015 so we were very lucky to get a chance to visit during our trip to North Korea. Apparently, we were some of the first westerners to see it. There were 2 newly renovated buildings. One is for babies and young toddlers aged 0-4 years old and the other was for 5-7 year olds. There’s no denying that the facilities at this orphanage were incredible- they had a pool, indoor play rooms with ball pits, bikes, loads of toys, a small theatre, dance room, an outdoor play area …the list goes on! We were really impressed by the orphanage itself- of course, that’s what they wanted- but there were just a couple of things that worried us a little, especially some of the violent cartoons painted on the walls. *In this post I am simply stating what I saw during my visit to Wonsan Orphanage and my thoughts on what I saw. I do not agree with the regime in North Korea and the subject of tourism in this country is a tricky one. I went in 2015 but since then tensions have gotten even worse-I currently wouldn’t recommend you visit. If you want to know more about my reasoning for visiting the country back in 2015 please see my other post here. Upon arrival we were greeted by our guide who helps run the orphanage. We took off our shoes and washed our hands and they gave us slippers to wear. It was immaculately clean inside. 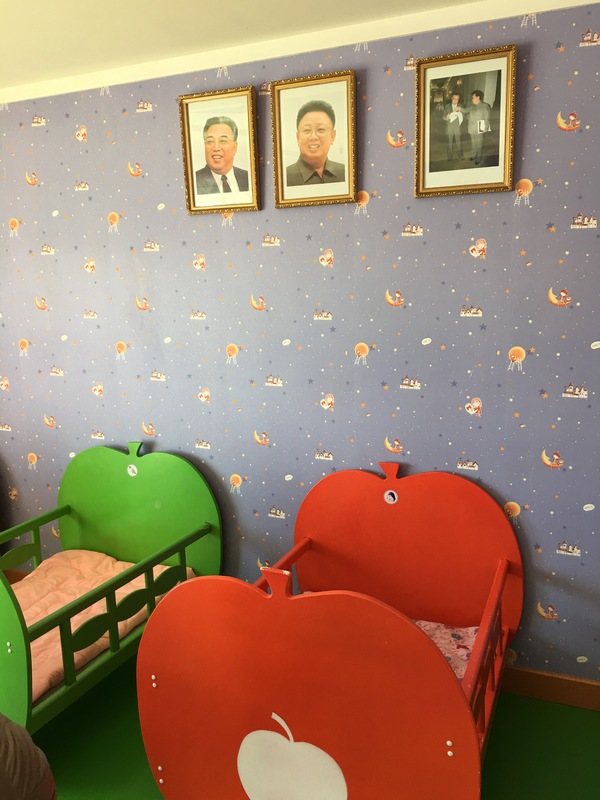 Much like every location we had visited in North Korea, there was a room dedicated to pictures of Kim Jong Un on his visits to the orphanage as well as pictures of the renovation in progress like a mini museum. The first building we entered was for the 5-7 year olds. We made our way to a small theatre with a little stage and watched a performance the children had prepared. I really wish I had asked if I could record it because it was like nothing I had ever seen before. I was too scared to get my camera out straight away what with it being children, but they were happy for me to take photos during the rest of my tour – so I probably could’ve recorded the performance. The children performed a mixture of song, dance and even some magic tricks. This was no ordinary school performance. Every child could sing well. Nobody was out of time and everybody was full of expression and really animated. You could never in a million years get a bunch of English 5-7 year old school children to perform like this- there’d always be that one kid that’d be picking their nose instead of singing and everyone would be out of time. But not these children, they were incredibly disciplined and not one of them stepped out of time. I’m aware that there are quite a few countries in the world that train children to dance and sing well from an early age- I imagine it’s very similar in parts of China and I heard Russia is like it too. This was the first time that I had seen something like this in real life. These children were performing to a standard beyond their years. As we left they were all big smiles and waves but I did wonder how genuinely happy they all are. After watching the performance, we were taken to a room where children were playing. Most of them were doing puzzles that seemed too difficult for their age but they were completing them with ease. All of the children were friendly but most were far too engrossed in their puzzle to pay much attention to us! We noticed that there was a good mixture of toys but there was definitely a large amount of army and weapons based toys which you’ll see more of later in this blog. The orphanage also had a small wading pool with showers and little cubbyholes for the swimming costumes and goggles (more photos of this later in the blog). There are rooms dedicated to learning about the leaders, Kim Il Sung and Kim Jong Il. I imagine there is a room like this in every school in North Korea. It is clear from my visit to the orphanage that children are basically taught from birth about how ‘great’ their country and leaders are. There is no evidence of any other history being taught to the children aside from a skewed version of the history of North Korea with an emphasis on the fact that everything is America’s fault! The children learn about Kim Il Sung’s life and childhood and what he did for the country- I think much of it is true but a lot is also fabricated. They also learn some of the many (there’s a lot!) songs written about him. Children learn to dance from a very young age. Although it looks much like a ballet studio, the children were learning a traditional Korean dance. Boys and girls were together in the same class. The children’s dormitories were SO cute. Each child had their own bed and cubbyhole of clothes, shoes and even a separate cubbyhole for their toiletries. Everything was kept very neat by the orphanage staff. We didn’t have the chance to get a close look at the outdoor play area since it was Winter and very cold outside so our guides didn’t want to stop for long. But we did notice the huge rockets, a satellite and missile launchers built into the play area! Next we entered the orphanage for babies and toddlers. We went into a room full of babies in walkers and I am not usually one to get all soppy around babies but these kids were adorable! Cubbyholes for the toddlers shoes -CUTE! When we arrived the children were just having their lunch. Each child had a small sectioned plate and rice and a soup. Although I’m not too keen on Korean food myself it looked quite nice with good portion sizes. Basically the same as the other study room – just with smaller chairs! The 5-7 year olds had a playroom almost identical to this one I just forgot to take photographs because we were busy playing catch with some of the children! Because it was lunchtime this playroom was empty. This room was for less active games like puzzles, books, building blocks etc. Toddlers Pool- Plus Mushroom Fountain! Goggles and Swim Caps Cubbyholes! Kim Il Sung once said that triplets are a sign of good prosperity so North Korea now has a strange obsession with triplets. Twins are considered to be special too but triplets get extra special treatment. If you have triplets the government will send you gifts- a ring for girls and a silver knife for boys. We didn’t realise until our visit to the orphanage that the government also takes your children away to be cared for by the state! We entered a room that was only for these triplets (2 girls, 1 boy). When we asked if they were orphans too our guide replied, ”no, their parents are alive and the dad works in the army”. We were shown a photo of the parents. ”Do they visit often?” I asked. ”Yes. Very often” was the response. I wasn’t so sure it was true. I got a weird vibe from the whole thing. They explained to us how the parents were very lucky to have their children cared for here. I certainly wouldn’t want my child brought up by nannies rather than their own mother. Throughout most of our visit we were hugely impressed by the orphanage and its facilities. I’ve never said the word ‘cute’ so many times in the space of an hour! However, every so often we would see something a little disturbing. The large amount of army toys was one thing – but even my little brother and I used to play with toy guns when we were kids. But then we saw these violent cartoons that depicted children attacking US soldiers. It made me realise that these innocent children are being taught to hate. It also sends the message that violence is OK and an acceptable method of dealing with people you don’t like. Another cartoon depicted a child saluting and holding a gun. These children will have no choice but to join the army for a couple of years when they’re older as it is mandatory in North Korea. They get it into their mind set early on that you should aspire to join the army and it is seen as an honour. The two pictures I’ve included here are of the worst ones we saw but there were others. Just to make it even stranger, amongst the violent cartoons there were paintings of Winnie the Pooh and other Disney characters like Pinocchio and Peter Pan. Visiting this orphanage was one of the most interesting experiences of the trip. But it did leave me with questions. As far as we were aware all of the children were orphans except the triplets. But what had happened to so many of the parents? Are there many more orphaned children in DPRK unable to get a place at this luxury school? We were not able to get answers. For more on my visit to North Korea please see my other blogs.